"Standards-based grading" means that students are graded on what they know and have learned how to do after they were taught a specific concept or skill. In standards-based grading systems, students, parents, and teachers have more accurate information about exactly what students should be learning and what they actually have learned as a result of instruction. The purpose of standards-based grading is to improve student achievement by focusing instruction and the alignment of curriculum with the essential standards. All assignments are based on a specific set of standards--Common Core State Standards--that students need to meet for each grade level and content area. Grades are not a comparison on one student to another, but rather a way to measure how well students are doing on grade level/course standards. A standards-based approach allows parents and students to understand more clearly what is expected of students and how to help them be successful in their educational program. The Common Core State Standards for Grade 5 Math can be found here. There are more tabs on the left of the Common Core website for each mathematical strand. The Common Core State Standards for Grade 5 English Language Arts can be found here. There are more tabs on the left of the Common Core website for informational text, writing, speaking and listening, and language. The Next Generation Science Standards for Grade 5 can be found here. Each standard is a hyperlink that can be clicked to get the specifics. Students in fifth grade will not receive percentage or letter grades. 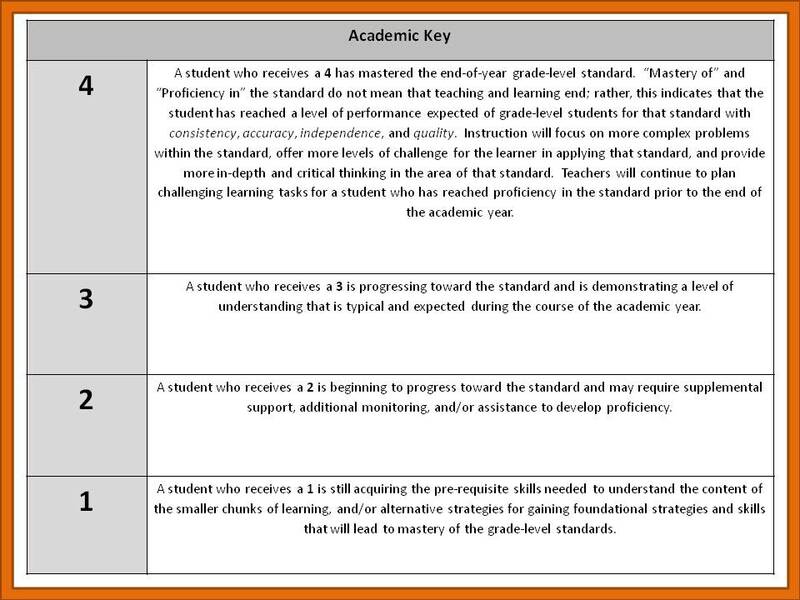 All assignments will be graded against the standards and use the 4-point academic key outlined below.